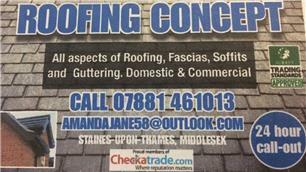 Roofing Concept - Fascia/Soffits/Guttering, Roofer based in Staines-upon-Thames, Middlesex. Welcome to Roofing Concepts’ Checkatrade page. My name is Riad and I have been in the roofing trade for around 7 years, in business for myself for 2 years. I am a sole trader who is very reliable and can assure you that all the work I complete is to the highest standard possible. October 2017 I attended a training course for Cure It Grp waterproofing system which has helped further my knowledge in the trade even further. I cover a radius of 20 miles from Staines. Feel free to give me a call on 07881461013 I hope to hear from you soon.